Baseball | Bring Your "A" Game Sports Talk! Bryce Harper continues to engender a strong response among his colleagues. 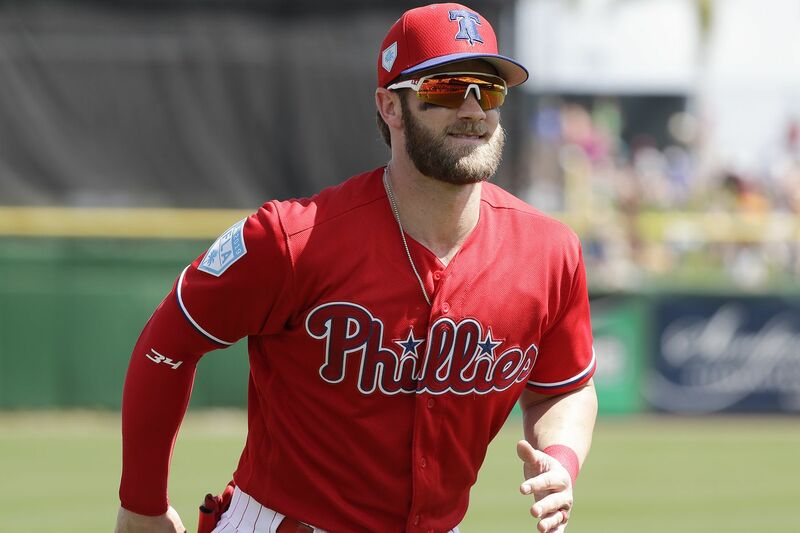 Harper was voted the most overrated MLB player in a new poll released this week. The poll was put together by The Athletic, whose writers asked players to vote on 20 items, including naming the most overrated player in the game. They say about a third of the players in the league participated in the poll. Harper was named most overrated by a wide margin, receiving 62 percent of the vote. Toronto Blue Jays pitcher Marcus Stroman was second at only 4.1 percent, while Giancarlo Stanton, Jason Heyward, Kevin Kiermaier, Manny Machado, Noah Syndergaard and Gary Sanchez also received multiple votes. No other topic where players were asked to name something had such an overwhelming favorite. The White Sox made a notable outfield cut Saturday, sending Nicky Delmonico to Triple-A Charlotte not long after Eloy Jimenez signed his new six-year deal. Rick Hahn wouldn’t 100-percent confirm during the press conference whether or not Jimenez would be on the team’s Opening Day roster, but the new deal eliminates the service-time conversation surrounding Jimenez and allows him to make his major league debut when the regular season starts next week in Kansas City. If Jimenez is going to end up on the Opening Day roster, the White Sox will need to make room for him. That could mean cutting another outfielder in addition to Delmonico, but not necessarily. More on that in a bit. Delmonico might have had a tough time making the Opening Day roster even if Jimenez would’ve started the season in the minor leagues. The White Sox outfield is a crowded one after the offseason addition of veteran Jon Jay. The presence of Adam Engel, Daniel Palka and the versatile Leury Garcia made it difficult to envision a place for Delmonico, who had a disappointing, injury-filled season in 2018 after showing promise at the end of the 2017 campaign. It seems as if, eventually, the White Sox could have to move another one of those aforementioned outfielders to make room for Jimenez, who figures to be the team’s everyday left fielder in 2019. But that decision could be delayed until mid April thanks to a bunch of built-in off days at the start of the regular-season schedule. This is not the Yankees shortstop announcement that we’ve all been waiting for, but the Bombers have reportedly agreed to a deal with Troy Tulowitzki, pending a physical. The good news is that the Toronto Blue Jays are on the hook for the $20 million left on his contract, and the Yankees will only have to pay him league minimum. Tulowitzki, 34, hasn’t played in a major league game since July 28th, 2017. He made 260 plate appearances that year, hitting .249/.300/.378 with seven home runs. A long list of injuries, including bone spurs and ankle issues, have kept him off the field of late. He was last an above-average (and barely that) hitter in 2016, when he managed a 104 wRC+. Best known for his time with the Rockies, Tulowitzki combined high-level defense with elite hitting. His 170 wRC+ campaign in 2014 stands out as a top season for a shortstop at the plate. He was a fearsome batter before injuries struck. The New York Yankees came into the offseason wanting to land one of the game’s best players, and they will reportedly do it. After careful consideration, Manny Machado is reportedly going to sign with the Yankees. According to Dan Clark, Machado received final offers from the Yankees, Philadelphia Phillies and Chicago White Sox recently. As expected, the official announcement isn’t slated until early January, but the All-Star shortstop is reportedly going to sign with New York. Have heard that the #Yankees, #Phillies, and #WhiteSox have all made their final offers to Manny Machado, and it is indeed New York where he’ll be heading. Announcement expected early-January. If Machado indeed signs with New York, it marks a major haul for the Yankees as they try to compete for their 28th World Series title and make it back to the World Series for the first time since 2009. While it isn’t known which position Machado would play in New York, his flexibility would give the team plenty of options. In addition to being an outstanding hitter that is coming off a 2018 season with a .297/.367/.538 slash line with 37 home runs, Machado is also one of the game’s best defenders at third base. If Machado signs with New York and moves back to his original position at third base, it could open the door for the Yankees to trade rookie Miguel Andujar and add a high-end starting pitcher.